Curing process: resin is fully cured within 24-72 hours of making orgonite, and during this time frame, the energy which surrounds the orgonite will shape it. That’s why it’s so important that orgonite is made in a suitable environment with good intentions. The most powerful vibration for making orgonite is that of love, therefore when you make orgonite, you should try to be in this vibration. You can also program the orgonite with specific purposes while it is curing. Orgonite size: The larger the size of orgonite, the larger the area it affects. Larger orgonites can neutralise more negative energy from the environment. 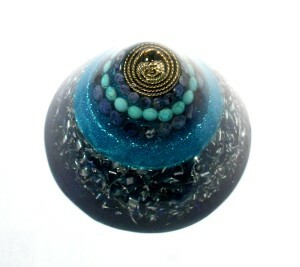 Orgonite shape: Shapes affect energy. It’s not a coincidence that pyramids have been built as sacred spaces in many places in the world. Pyramids are very powerful and sacred. However there are also other shapes of orgonite that are effective. In my opinion, pyramids have a sharper, cleansing energy, while spherical orgonite feels more soothing and calming. The right ingredients: It’s important for orgonite to contain a roughly 50:50 mixture of organic and inorganic substances, as well as a piezoelectric crystal. There are many people making “orgonite” which does not contain enough metal. It may well have healing properties due to the crystals contained inside, but it isn’t real orgonite. Other gemstones: Different gemstones can be added to give orgonite a boost for its purposes. It’s important that these stones are cleaned before using them, as many stones will absorb the energy they are surrounded by. These crystals should then be charged before using. Once the stones are embedded in the orgonite they will not need further cleaning or charging, due to the self-cleansing nature of orgonite. Metals in orgonite: It’s important to use metals that are the right shape – not too small or too large. Also, the best is to use uneven metal filings. To find out about the different ingredients that can be used in orgonite, check out this article on orgonite-making supplies. heej beautifull one, t.y. for your magical stuff and presence! <3 where do u get the charmbackings?? ?